UPDATE: See the updated Best HID Headlights 2017. With many options available, we wanted to simplify your selection process by identifying the 3 best HID headlights, as well as provide some basics about HID headlight technology. High Intensity Discharge (HID) headlights are among the most advanced technology in the headlight industry. Hundreds of thousands of vehicles roll off the assembly line each year equipped with HID headlights, and there’s a good reason for it. HID headlight technology is far superior to that of halogen headlight bulbs, and in this complete buyers guide, we’ll show you what makes them stand apart from the rest. Replacement HID headlight bulbs: if your vehicle came equipped with HID headlight bulbs from the vehicle manufacturer, you’ll be looking for a replacement bulb. HID Conversion Kits: if your vehicle came equipped with halogen headlight bulbs from the vehicle manufacturer, you’ll be looking for a kit that converts your halogen equipment to an HID setup. 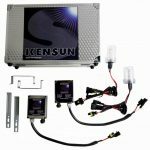 You can find that info in a different article titled “3 Best HID Conversion Kits: The Complete Buyers Guide“. Not Sure if you Have HIDs or Halogens? Normally you can tell by the color. Most HID headlight bulbs are a brighter white than halogens. The light is also more intense. If you’re still not sure, check your owners manual, or pull the bulb out and look at it. If it resembles the bulbs you’ll see below, you have HIDs. Topping our list of best replacement HID bulbs are the Kensun Xenon HIDs. In a relatively short amount of time, Kensun has become a major player in the world of HID replacement bulbs, beating out brands like Philips and Sykvania. They got their start in HID conversion kits, and have naturally progressed over to replacement bulbs. 12 color choices: close competitors don’t offer any color options. While most replacement HID bulbs come in 4300K, these are available in Pink, Green, 4,300K, 5,000K 6,000K, 8,000K, 10,000K, 12,000K, 15,000K, 20,000K, 30,000K (not all colors are street legal). Which color HID bulb you choose is a matter of personal opinion, but if you ask me, I prefer 6000K. A color temperature of 6000K is hyper white that is teetering on having a bluish hue to it. More than that, and you’re getting blue light which is harder to see at night, and less than that you’ll be moving towards yellow light which doesn’t look as good. 8 Size Options: not all competitors offer this many sizes. Some will only manufacture a few that are most common, while Kensun offers many different sizes including: D1R, D1S, D2R, D2S, D3R, D3S, D4R, D4S. Plug & Play Installation: although most replacement bulbs are also a plug and play installation, this one is too. The installation usually takes less than 20 minutes and does not require that you make any modifications to the stock equipment (as long as your vehicle came equipped with HID headlights originally). Installation is as easy as removing the old bulbs and replacing them with new ones. In my experience, the best way to learn how it’s done on your specific model, do a quick search on YouTube. Chances are, someone as made a video about “how to replace headlight bulbs on ______”. Much Less Expensive than OEM: Purchasing replacement HID bulbs from your local dealership can cost $200+. Some might make the argument that OEM is better and more reliable, but in my opinion, if you’re paying over $200 for replacement bulbs, that amount of money will buy you 6 pairs of these. Chances are, the lifespan of 6 pairs of Kensun Xenon HID headlight bulbs will last much longer than one pair from the dealership. Lesser known brand name: there is something to say about a tried and true brand name that has been around for many years. This is not the came for Kensun, however that does not mean their product are inferior, it just means that time will tell is they become a household name like Philips and Synvaina. Reported quality issues: during our research, we encountered the occasional bad review and/or report of quality issues. These were rare, but still happened. Kensun claims to be “#1 in customer service” so if any issues arise, they’ll likely take care of it. Overall, when it comes to replacement HID headlight bulb, the Kensun Xenon HIDs shone the brightest (pun intended). With their many color options, easy installation and exceptional reviews, these easily took the top spot. 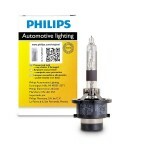 Coming in at second place is the Philips Xenon HID headlight bulb. Philips is a household name in the world of light bulbs, both for home and automotive use. You don’t become a household name by making poor quality products. Founded in 1891, Philips is a Dutch technology company, headquartered in Amsterdam. They manufacture a variety of products, but specialize in lighting. It’ also important to note that they are a publicly traded company. So who cares? Well, by understanding the company, you better understand what they’re about, and the pressures that drive them. For example, knowing that they are a publicly traded company tells you that they have share holders to answer to. Naturally they’ll be concerned with quality control, manufacturing processes and customer experience. DOT Compliant & Street Legal: unlike some of the Kensun bulbs, the Philips HID headlight bulbs are street legal and DOT (Department of Transportation) compliant. When you install these, you can rest assured that you’ll have no issues with law enforcement. Although you won’t get the bluish spectrum of color like you do with other manufactures, there is definitely something to say about peace of mind. Available in 10 Sizes: these are available in the following sizes: D1R, D1S, D1S HID, D2R, D2S, D2S HID, D3R, D3S, D4R, D4S. If you’re not sure which size fits your vehicle, the Sylvania bulb guide is an excellent resource. Brand Name Reliability: With a name like Philips, you can expect a high quality product that will last a long time. And in the rare case that you get a lemon, Philips offers a 12 month limited replacement warranty. The perks of dealing with large established companies. Plug & Play Installation: these too are easy to install, just remove the original bulbs, and replace them with the new once. Again, if you’re not sure how to do that, do a quick search on YouTube, you’ll likely find a video walkthrough. Warranty: Unlike many HID replacement bulb companies, Philips offer a 12 month limited replacement warranty. Much Lower Cost Than OEM: Although these are slightly more expensive than the Kensuns, they are still much less expensive than buying them from a dealership. One Color Option: This bulb is only offered in the 4300K color option. As can be seen in the HID color temperature guide, 4300K is a white light that skews towards the yellow side. For some, this is the preferred color, so it’s not the color that is bad, it’s the fact that there is only one option that is bad. 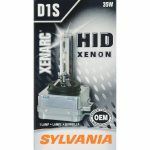 Coming in at 3rd place is the Sylvania HID Headlight Bulbs. Once again, we’ve chosen a HID replacement bulb with a solid brand name. Sylvania was founded in 1993, and is headquartered in Canada. Sylvania has quickly become a household name in the lighting industry, making bulbs for home, commercial and automotive use. They are one of the pioneers of high performance automotive headlight bulbs, with their Sylvania SilverStar headlight bulbs product line. 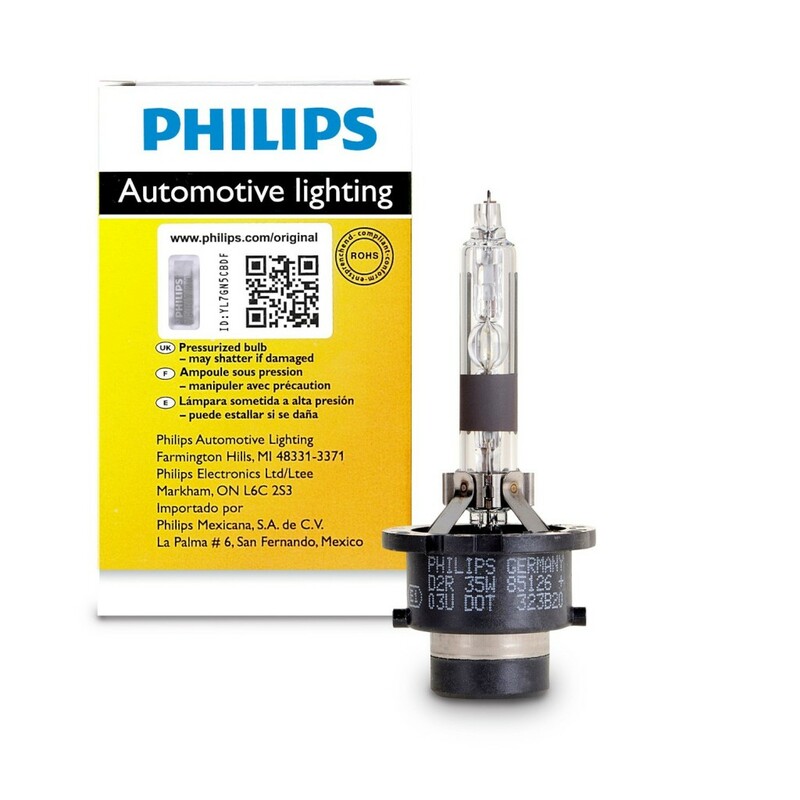 Brand Name Reliability: Like the Philips HIDs, the Sylvania HID replacement headlight bulbs also offer the quality and reliability that come with a large and established company. When buying and installing these, you can rest assured that you’re getting a product that will be consistent and will last. Plug and Play Installation: As is the case with all replacement HID bulbs, installation is as easy as easy as removing the old bulbs and installing the new ones. Color Temperature Ideal for Eyes: This may be a little bit of a stretch, since the color of the light output is very subjective, however, some claim that 4300K is the ideal color temperature. There is likely some validity to this argument since many car manufacturers put 4300K in their vehicles as original equipment. 4300K will appear white, but will not have a bluish tint to it. If that’s what you want, this is perfect. If not, you might want to consider an option like the Kensuns that offer many more color options. If you plan to replace one bulb and not the other, make sure you know what color the other one is, otherwise the headlights won’t match. As a bit of advice, I suggest always replacing headlights in pairs whenever possible. That way they always match. Less Expensive than OEM: Although these are the most expensive of our top three, they are still less expensive than buying OEM (original equipment manufacturer) from the dealership. Only One Color Option: We like to see options here. Enough said. No Stated Warranty: Although there likely is some kind of warranty, with it coming from a large company like Sylvania, there is not one stated. What are HID Headlights / How Do HID Headlights Work? HID (high intensity discharge) headlight bulbs are much different than halogen headlight bulbs in the way that they emit light. HIDs have a glass chamber of gas that when ignited by 23,000 volts of electricity emits an enormous amount of light. Once illuminated, it only requires a 12 volt power source to maintain ignition. There are ballasts in your vehicle that are connected to your headlight bulb that supply the initial surge as well as the constant 12v stream. HIDs are able to product much more light while drawing less power from your vehicle than halogen headlights. Some manufactures claim that at 35 watt HID headlight bulb can produce 3 times as much light as a 55 watt halogen headlight bulb. In addition, HIDs need 20 amps upon ignition, and 3 amps of continuous power to maintain the light, while halogen headlight bulbs need 10-15 amps of continuous power. Also, HID typically last much longer than HIDs. 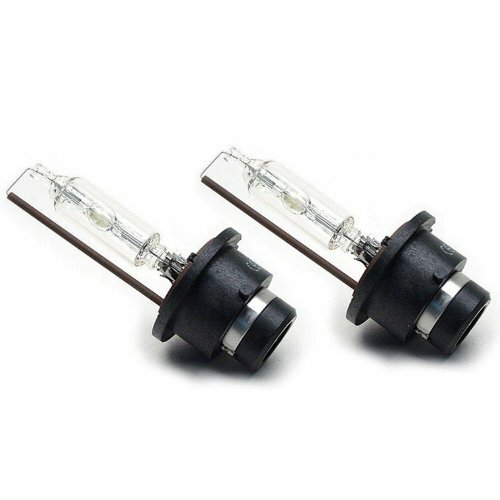 This is because HID use gas instead of a filament with is much more durable when it comes to the vibrations and bumps that headlight bulbs will endure in a vehicle. Longer service life: some claim that HIDs will outlast halogen headlight bulbs by 10 times. More light output than halogen headlight bulbs: most manufacturers claim 2-3 times more light output. Higher color temperatures while maintaining light output: This allows you to have the hyper whites, blues and purples, without sacrificing light output. Halogens can deliver those colors with coatings on the glass bulb, but coatings restrict light output and make it difficut to see a night. More expensive: this is not always the cased depending on the quality of the bulbs you’re comparing, but generally, HID bulbs will cost more than halogen bulbs. 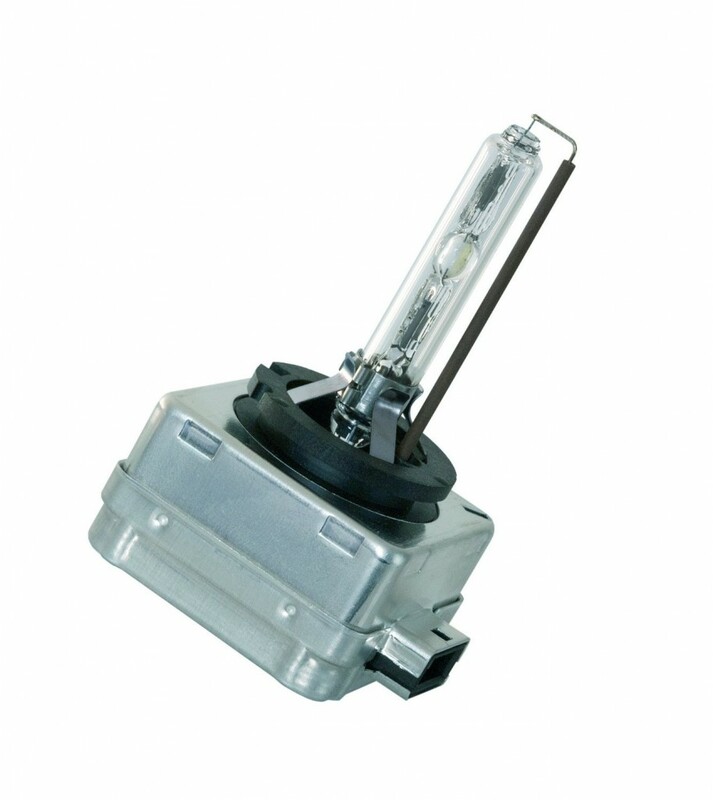 As has been mentioned above, HID headlight bulbs generally outperform halogen bulbs by 2 to 3 times. Granted, these claims are made by the manufactures of HID bulbs, however, anyone who has experienced both types of bulbs can tell you that HIDs tend to throw more light than halogens. What is the Best Color Temperature for HID Headlights? The answer to this question is largely a matter of opinion, however, color temperatures in the range of 4,300K to 6,000K most closely resemble natural sunlight. As humans, our eyes are built to best see in natural sunlight, so with that argument, the best color temperature for HID headlight bulbs are 4300K to 6000K. When possible, if you’re going to replace one, replace both. When only one is replaced, people often experience headlight with light colors that don’t quite match. Over time, the light output color can change slightly, so if you replace only one, the headlights might not match. If you don’t care about that, you can replace one and be just fine. If you’re like me, that would drive me nuts, so I suggest you change them both. We hope you find this useful. If you have advice you’d like to add, please comment below. Projector vs Reflector Headlights: Which is Best?